Agilent 54641D has a ADC hybrid (1NB7-8394) converter that runs very hot. The heatsink does a very good job extracting the heat from the chip, but there’s nothing to carry the heat away from the heatsink. The heatsink is actually hand-burning hot when passively cooled. Even with the case, the bottom of the unit gets so hot that it actually warms up the instrument below it. 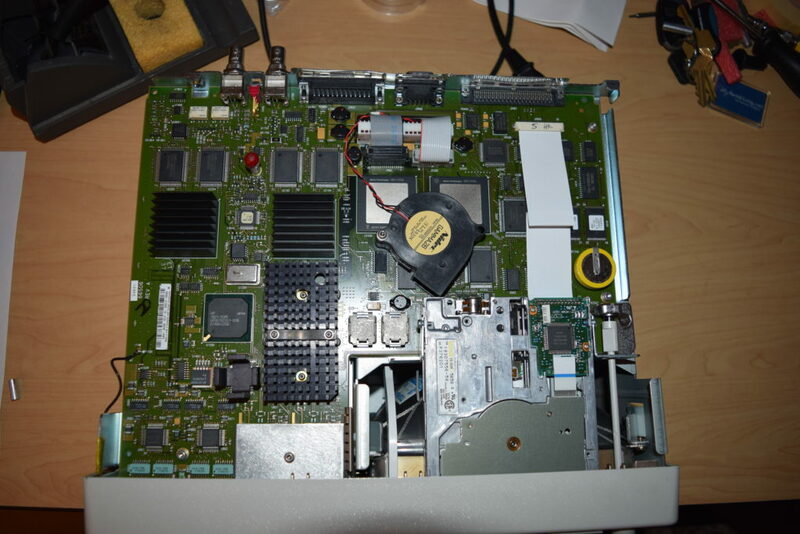 I padded the fan with 3 plastic washers to create a surface level with the two ASIC chips the fan is sitting on. Where should I get the power for the fan? It’s not a low-end 100Mhz scope, so I took extra precaution to not have a DC power line flying all over the circuit board to generate noise. I twisted the power wires together just to lower the EMI and follow the same holes Agilent designed to let the power cable go through. It’s a little risky to steal power from the circuit board directly when I don’t have the schematics, but luckily I found a printer power port which nowadays nobody uses which I can steal the power from. 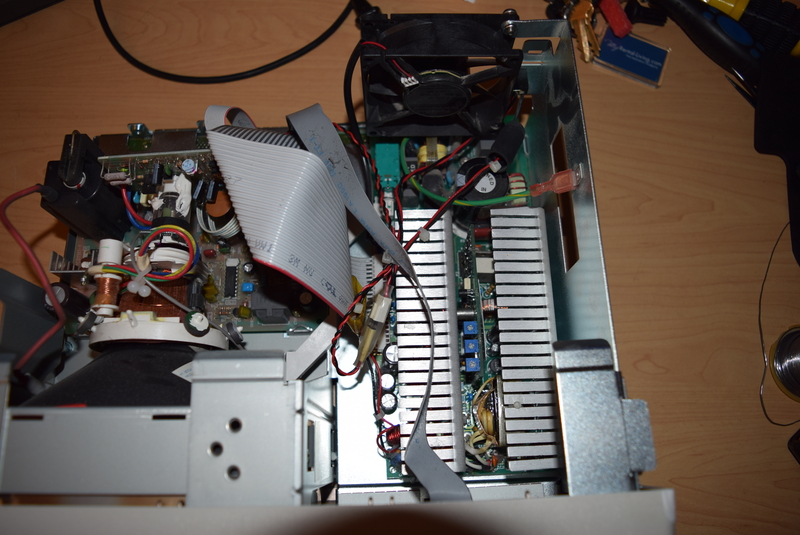 I could have tapped the 12V fan power from the power module for the power supply fan, but I noticed the printer power port is even better: it’s around 7~9V: I don’t want the noise from running it at full speed (squirrel cage fan are typically noisier). 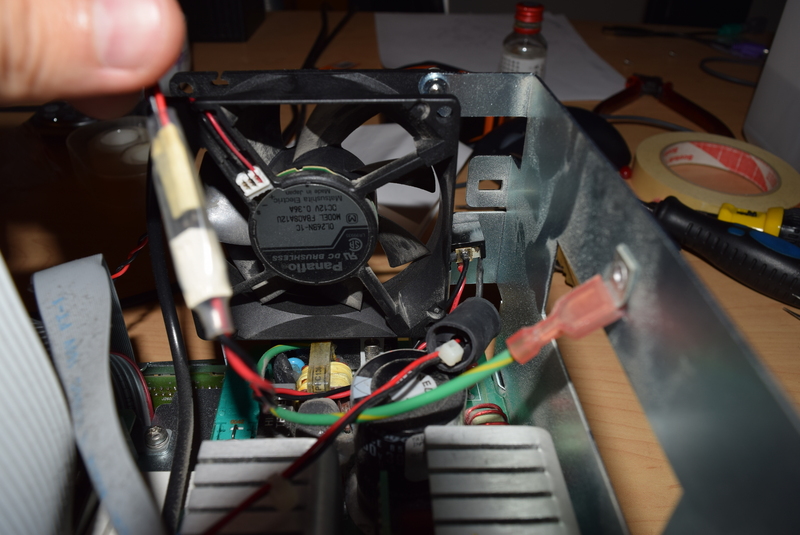 Finally I made an internal terminal for the printer power so the fan can be easily detached. Weakly wrapped it in a clear heat shrink tube so it won’t get accidentally disconnected yet reminds myself that a connector was built instead of directly soldered on. At last I tie-wrapped the power wire to the other power wires Agilent already secured so they won’t dangle during transportation. Self-calibration expects the temperature to be stable, so the oscilloscope needs to be warmed up before a cal would register. That means before the fan, it’d take a long while for the ADC to heat up to a guaranteed temperature. With the new fan, the calibration needs to be done again because it’s much cooler now. Even better, it takes nearly no time to warm the oscilloscope up for calibration because the steady temperature isn’t high anymore. Of course this mod works for 54641A, 54641D, 54642A, 54642D as well. Technically you can put it in any 5462X oscilloscope, but since they are 100Mhz, you don’t need to cool the ADC down that much. The suction part came from the bottom of the case instead of the board. That means I’m blocking ventilation for some components. In other words, even if it looks tempting to deviate from my original solution for the non-MSOs, there’s no good reason doing so. 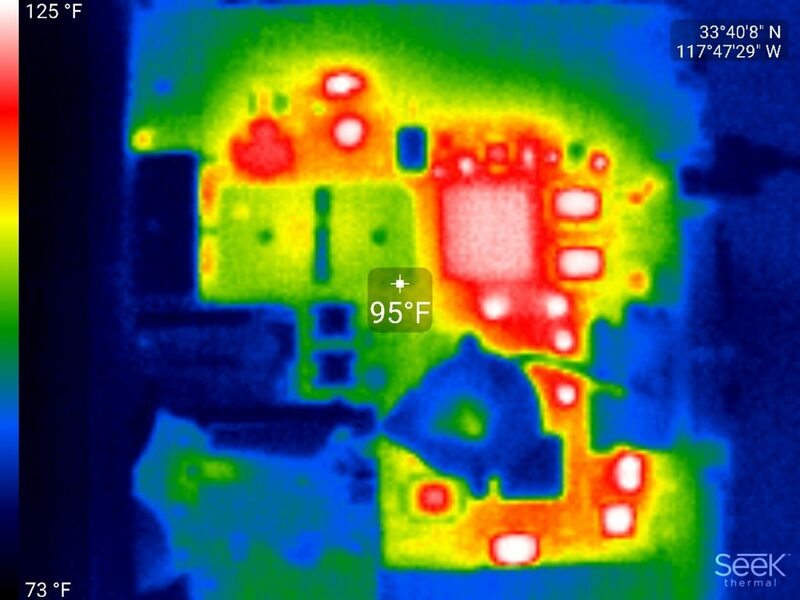 You can see from the thermal picture how effective the heatsink is. It took only a very weak breeze to carry the majority of the heat away. The 12V squirrel cage fan running at ~7V is pretty quiet, yet it cools the ADC hybrid down to near room temperature. The real reason why I did this fan mod is because I had some units (like 54641A) bought from the used market that after powering it up for 30 minutes, the signal displayed just went nuts and jumped all over the place. I opened up the ADC and the metal bracket holding it down had a lot of heat stress pattern on it (the golden bracket looked purple-rainbowish). The unit was fixed after swapping the ADC hybrid from a donor unit, but now I know the ADC hybrid really needs to be kept cool to ensure longevity. By the way, if you need a replacement ADC hybrid (1NB7-8394), I have 2 pcs at $660/ea. First come first served. 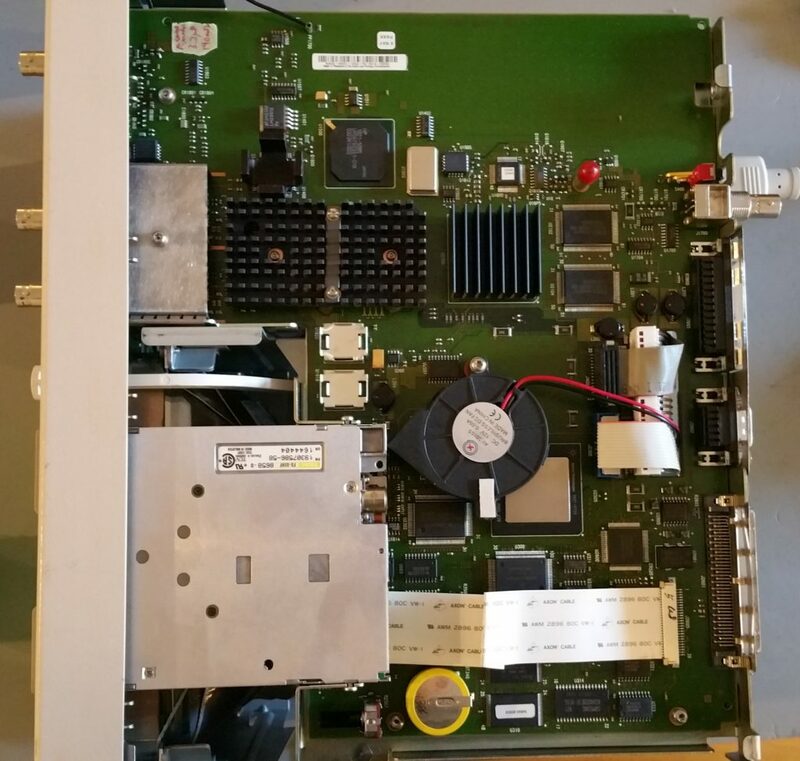 Call me at 650-804-5024 if you suspect it’s the ADC hybrid that needs to be replaced. The fan mod is complimentary with any repair/service I do for 54640 series oscilloscope that exceeds $800 after parts and labor.